The start will be from Colfosco (Val Badia) on Saturday 13 2019 at 5.00 a.m.
To be fully aware of the length and difficulty of the race and to have undergone adequate training in preparation. 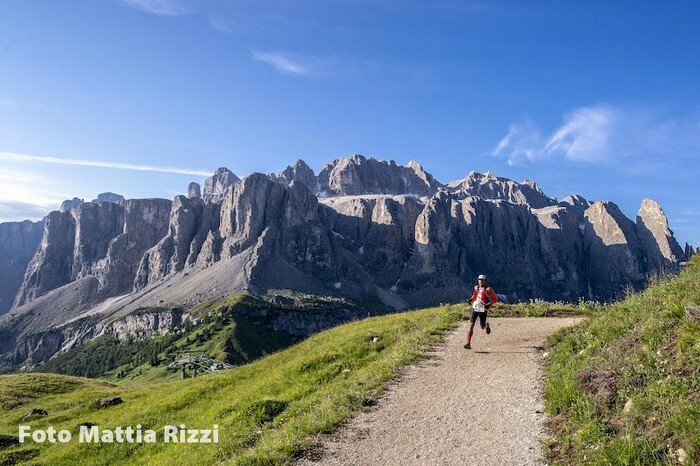 DoloMyths Run Sellaronda Ultra Trail mostly takes place on high mountain trails: it is essential that you are comfortable with running on Alpine paths. The start of the race will take place in turn in Canazei (Val di Fassa) and Corvara (Val Badia) changing year by year. For the year 2019 the start of the race will be on Saturday July 13 at 5.00 o’clock from Colfosco. The check of the equipment is scheduled at 4.30 a.m. The race will take place all around the Sella Massif, along dirt roads and paths, trying to avoid as much as possible asphalt roads and crossings on national roads. The racetrack is about 61,50 km long with an altitude difference of 3.378 m. The race will cross the towns of Colfosco and Corvara to face, soon after, the climbing to the Campolongo Pass, running down to Arabba, climbing the Bec de Roces and the Pordoi Pass right after, run through the Sella Pass and down to Selva Valgardena, along the demanding ascent of the Dantercepies ski slope before the long descent towards Colfosco where the race ends. The two athletes who will pass for first at the "Sprint Felix" in Selva Val Gardena at the 50th kilometer of the racetrack will be awarded 100,00 € to the first man and 100,00 € to the first woman. The Jury has the right, at any time, to change the course of the race and the position of both refreshment and first-aid points. In case of bad weather conditions the race can be delayed or cancelled. The Organizing Committee can suspend the race or can change the time limits imposed in case of specific conditions that could be considered dangerous for runners. Should the competition be cancelled, the entry fee would not be refunded. Any specific decision about it will be taken only by the jury.